What words do you think of when you stare wantonly at these cupcakes? Lascivious? Devilish? Crazy amazing? Then you are absolutely on the right track my friends. These are ALL THAT and more. I never even pretend to be humble when it comes to my mad baking skills. What could be better to drool over and scarf down than a dark chocolate DIPPED, peanut butter cream cheese frosted, Devil’s food cupcake? Really…nothing. Nothing. At. All. The cake is rich, chocolatey and completely soft and tender heaven. The frosting’s creamy, sweet and a tad salty and then, as if it is not already the Queen of cupcakes, it gets a nice chocolatey bath. So, here you go, with the recipe, details and anything you would need to recreate these. And, when you are face first in your third cupcake and you are beginning to shout obscenities at me from where ever you are, I will smile because I am kind of sadistic when it comes to my baked goods. I like to see just a bit of control lost and a little suffering when the said baked good is gone. Aren’t you glad you don’t live near me? Because we are all about providing a full service over here at S&C, I am giving you my original recipe for these AND my favorite GF chocolate cupcake recipe. See, I am not all bad. To make the AP Flour cupcakes: Prepare pan by placing cupcake liners in muffin pan. Preheat the oven to 325 degrees Fahrenheit. In a stand mixer or mixing bowl, combine oil, buttermilk, yolks, and vanilla. Beat 2 minutes with a paddle attachment or with a hand mixer at medium speed. In another bowl, sift together (or use a wire whisk like I do to avoid sifting) sugar, flour, cocoa powder, baking soda and salt. Bake for 20 minutes or until the cake is spongy to the touch. It should bounce back when touched lightly and look firm. Cool completely. To make the GF Flour Cupcakes: Prepare pan by placing cupcake liners in muffin pan. Preheat the oven to 325 degrees Fahrenheit. In a stand mixer or mixing bowl, combine oil, buttermilk, yolks, and vanilla. Beat 2 minutes with a paddle attachment or with a hand mixer at medium speed. In another bowl, sift together (or use a wire whisk like I do to avoid sifting) sugar, flour, cocoa powder, baking soda and salt. With mixer on LOW speed, add one third of the sifted dry ingredients to oil mixture and beat until blended. Then add one third of the hot water and slowly combine these (you don’t want the hot water to splatter on you…ouch!). Continue this process, scraping down the bowl often until all ingredients have been add and mixed. Pour batter into prepared liners, 2/3 full. Bake for 20 minutes or until the cake is spongy to the touch. It should bounce back when touched lightly and look firm. Cool completely before frosting. 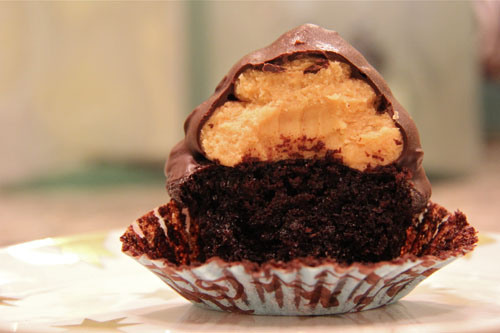 To frost: Fit a pastry bag with a large circle tip with a big opening to pipe the peanut butter frosting in the shape of a chocolate kiss on top of each cupcake. Freeze the frosted cupcakes for an hour. After the hour, take the cupcakes out of the freezer and melt your chocolate. For the Chocolate Coating: Melt your chocolate chips in a microwave safe bowl for one minute and then stir. Then microwave for one minute more. It should be just barely melted and once you stir it up it should be smooth. If it’s not, then heat it up for another 20 seconds or so. You don’t want to melt your chocolate too long because it will end up getting lumpy and seize up. Let cool for five minutes. 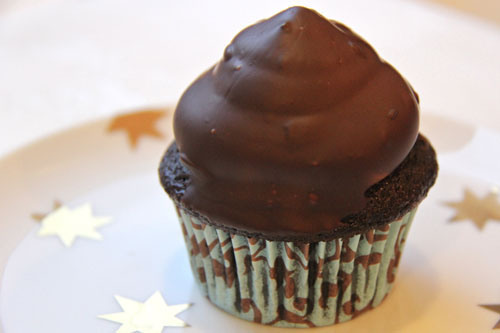 Carefully, dip each cupcake upside down into the chocolate, holding onto the wrapper portion. Twist the cupcake gently in the melted chocolate and stand back up on a plate. Refrigerate your cupcakes for at least an hour before serving. Store cupcakes in the refrigerator since they are coated in chocolate. Categories: Chocolate, Cupcakes, Gluten Free, Uncategorized | Tags: chocolate dipped peanut butter fudge cupcakes, devil's food cupcakes, Gluten Free Chocolate cupcakes, gluten free devil's food cupcakes, peanut butter frosting, soft and tender gluten free cupcakes | Permalink. Thank you so much. They are pretty addicting. Oh that peanut butter frosting has my complete attention! Such an intoxicating dessert! Thank you Deb. I could eat just the frosting and be a happy girl. Wow these look incredible! Delicious!! Thank you! I hope you get a chance to try them. Thank CCU! That means a lot coming from you. Oh my goodness. Excuse me for a minute as I wipe the drool off my keyboard. I am so making these! I hope you do get a chance to Bobbie. Drool and keyboards don’t mix, sorry, my bad. Wow, thanks so much. What nice compliments! They look luscious and amazing, Geni! Thank you much Angie. How kind. Oh how delicious! Chocolate and peanut butter has to be one of the knock out combinations. I’m going to be daydreaming about that frosting all day. Then you need to make it to make your dreams come true. 😉 Thank you! I love the peanut butter frosting and the chocolate dipping idea for cupcakes! So great! I had it at a cupcakery in San Diego once and just about died. It was an ingenious idea that I had to recreate. thanks! I have ALWAYS wanted to make these types of cupcakes! This looks super delicious! Yes, an indulgence they totally are (now I sound like Yoda!). Thank you! Oh my do I want to try these!!!! They look freaking delish!!! Thank you!!!! It’s so nice of you to take the time to comment. Just the title of this post has my mouth watering! Yum!!! That’s the idea Liz. Thanks so much! seems very reasonable and their recipes are simple and home hearted! Mom used to make peanut butter balls dipped until covered in chocolate. Your cupcakes look like the two of your conspired. You made the cake and she supplied the topping. This hits all the right notes for me, Geni. What a fantastic cupcake! Oh, I make Buckeyes which sound like your mother’s treats. Those are pretty great! Thank you John. I guess these are a great marriage of the candy with cake. These look stunning, I am so weak for anything with chocolate and peanut butter!! ME TOO! Totally weak, and I must get them out of my house quickly when I make them. Thanks for the compliment! You and me both sister. Yum! Thanks Jessica. Hope you are great! This looks absolutely incredible! I really want to make this now. How do you come up with these recipes? Also who does your photography? This blog is really well done. You are truly a mad baker, Geni, in every good sense of the word. 🙂 These are positively wicked! These are crazy rich and over-the-top but everyone needs a little chocolate sinfulness every now and then. 😉 Thanks for stopping by! Just great!I wanna try it right now! Mmmmh!! Can it get any better? A moist chocolate cake, with a creamy peanut butter topping dipped into a smooth decadent chocolate sauce which hardens and is served cold. Check out this recipe because you haven’t lived until you’ve tried these cupcakes.